W. Michelle Harris is a media artist and a professor at Rochester Institute of Technology who is the resident media artist at BIODANCE. Creating and performing digital media projection, motion capture, light and image design, she has been an ongoing collaborator with Missy Pfohl Smith at University of Rochester and BIODANCE since 2013, when the team premiered the award-winning, sold out Fringe hit “Anomaly.” Michelle’s work mixes digital media material to engage the audience while addressing the roles of women in American culture. Her work (solo and collaborative) has been shown at such diverse venues as the ACM SIGGRAPH, World Maker Faire, and the reActor International Conference on Digital Live Art, as well as regional venues such as the Baobab Cultural Center, Community Folk Art Center, Schwienfurth Memorial, and Four Walls. She has done visuals for performances in collaboration with choreographer Juanita Suarez (ImageMovementSound festivals and the Be Here Now ensemble), Sound ExChange orchestra, and BIODANCE (Rochester Fringe ’18, ‘17, ’16, ’15, ’13 Festivals, among other projects). She received her BS in Computer Engineering from Carnegie Mellon University, and a MPS in Interactive Telecommunications from New York University’s Tisch School of the Arts (where she had the honor of interning with Troika Ranch). 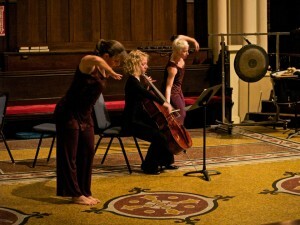 Sound ExChange is an organization under the Artistic Direction of Emily Wozniak and based at the Eastman School of Music that responds creatively to the following question: how can live instrumental music thrive in contemporary culture? Sound ExChange explores alternative ways of presenting all genres of music with the hope of enhancing the traditional concert experience and engaging all audiences. We believe music is not only relevant to society; it is essential to our well-being. This ensemble is dedicated to exploring what the current generation of musicians can do to contribute to the vitality of orchestral and chamber music. The goal of Sound ExChange is to offer a new experience with music by breaking down the barriers that normally exist between the audience and performers. At our concerts the audience members are encouraged to sit within the orchestra, which allows them to connect with musicians and be immersed in the sound. Sound ExChange seeks to demonstrate the relevance and impact of music to new listeners and to facilitate a social and intellectual exchange between the audience and musicians. Matt Costanza received his MFA from the School of Film and Animation at Rochester Institute of Technology. He actively develops his art, through experimental and documentary film, photography, and other media. His films demonstrate unseen or altered views of our reality, and his photos offer a quiet look at the world and modernity. Costanza’s work has been seen and screened internationally at a variety of prestigious events and has won numerous awards. His first feature length documentary, which he directed in a Nairobi slum this past December, is currently in post-production. More information is available online, at www.mattconstanza.com. 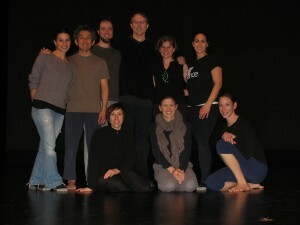 Randy James has built an international reputation as an exceptionally gifted master teacher and an emotionally evocative choreographer, receiving commissions from dance companies, colleges and universities. The New Jersey State Council on the Arts/Department of State honored him with a Choreographic Fellowship Award in 2004 and 1994 for recognition of his artistic excellence. Mr. James received the New Jersey Governor’s Award in Arts Education and was named Distinguished Teaching Artist in 2002. He has been a guest artist at various institutions including the American Dance Festival, Jacob’s Pillow, London Contemporary Dance theater and School, VII Annual International Contemporary Dance Conference and Performance Festival in Poland, Tage des Tanzas in Germany and Austria, Fine Five School in Estonia, Via Danse in Latvia, among others. Randy was born and raised in New Jersey and currently lives in Highland Park. He began his training as a dance and theater major at Mason Gross School of the Arts/Rutgers University, where he is currently a tenured faculty member. His performance background includes summer stock, dinner theater, regional ballet companies and nightclub revues. He has also performed with the Metropolitan Opera Ballet at Lincoln Center in Aida and was principal dancer with Dan Wagoner & Dancers for eight years. Thomas McMahon grew up in Buffalo and started playing guitar at the age of 13. He has played in bands including Monolithic Green in NY and with members of Simplified in Charlotte, NC. Thomas has recorded two solo albums including Beast Of A Manand Leaving The City Of The Queen. He is currently mixing his latest album with his present band Old Iron Council as T-Bone Iron. He has plans to return to NY and join the band Paperbombs within the next year. Thomas is a composer and performer and has taught himself first and foremost to play guitar, but also mandolin, drums, banjo, melodica and keys. Mark Olivieri is an Assistant Professor of Music at Hobart and William Smith Colleges. He has played and composed for luminaries like the Jose Limon, Sean Curran, Doug Varone, and Shapiro and Smith Dance Companies. In the fall of 2009, Olivieri co-founded the improvisation ensemble Be Here Now with Juanita Suarez. Olivieri is Artistic Director of the Vision of Sound New Music and Dance Festival, and Assistant Director of the Musselman Arts Triathlon; a twelve hour arts performance at the Smith Opera House in Geneva, N.Y. were musicians, dancers, and visual artists come together to collaborate in the arts. Olivieri has received numerous commissions from various performers and ensembles throughout the U.S. and abroad. His recent work, Stress Test for piano concertino, was commissioned and performed by acclaimed Society for New Music. His most recent commissions include a triptych of encore pieces for the Tangletown Trio, which premieres in Seattle, Washington in January. Olivieri lives in Spencerport, N.Y. with his wife Alaina and their five children. They own a minivan. The Rochester Oratorio Society, founded in 1945, is the leading choral/orchestral ensemble in Rochester, New York, and the surrounding seven-county region. The mission of ROS is to produce live choral music of the highest quality, engaging and educating our community in numerous musical genres, and gratifying our volunteer singers with the professionalism of their art. Led by Maestro Eric Townell since 2006, the Rochester Oratorio Society gives voice to the very best qualities of Rochester and western New York. Comprising approximately 145 auditioned, adult members in a typical performance season, the ROS presents two to four performances of predominantly well-known masterworks for chorus and orchestra from the 18th-20th centuries. Allen C. Topolski is primarily an installation artist whose studio production incorporates found materials and a variety of processes to explore nostalgia and memory in technologies of domesticity and convenience. He has exhibited his work at the San Jose Art Museum, the Islip Art Museum, Memorial Art Gallery and in Toronto, New York and most recently, Buffalo at the Buffalo Arts Studio. Topolski attended Bucknell University and received his MFA from Penn State; he is an Associate Professor of Art at the University of Rochester where he teaches a variety of studio courses that range from introductory drawing to advanced level conceptually-based multi-media courses. Abby Aresty is a composer who strives to create works that offer insight into her passions: compassion for animals, environmentalism, feminism and social justice. Aresty received her Masters degree from the University of Michigan, and her Bachelors degree from the Eastman School of Music at the University of Rochester. She has studied acoustic composition with composers such as Bright Sheng, Michael Daugherty, Ricardo Zohn-Muldoon, David Liptak and James Willey, and electronic music with Evan Chambers, Erik Santos and Allan Schindler. At the University of Rochester, Aresty was a Take Five Scholar and a member of Student Association of Vegetarian and Vegan Youth, Grassroots, Students for Social Justice, and Women’s Caucus. Now in Seattle, Aresty is earning her doctoral degree in music composition at the University of Washington. 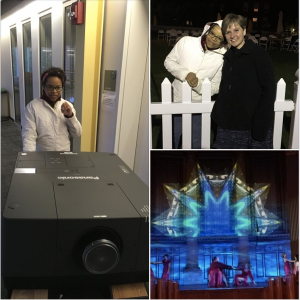 Mark Wenderlich (Lighting Designer/Technical Director) hold an MFA from Syracuse University and a MA from the University of Iowa. Mr. Wenderlich has designed for various guest artists at the colleges including: Risa Steinberg, Sean Curran, Lisa Race, Claire Porter, Soundance, Pepatian, Jennifer Muller, Misnomer Dance Company, Lingo and Ananya Chatterjia. He has served as technical director for artists such as Maureen Fleming, Jane Comfort & Company, Marles Yearby, Second Hand Dance, and the Paul Taylor Dance Company. Mr. Wenderlich is Lighting Designer and Technical Director at Hobart and William Smith Colleges, a half time Associate Professor of Theatre at Keuka College, Executive Director of Geneva Arts and a professional actor/director. He holds membership in AEA, SAG, and AFTRA and USITT. 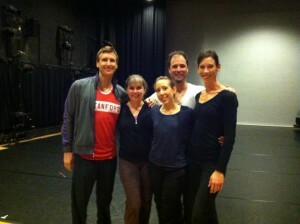 Recently he was accepted as a member of the Society of Stage Directors and Choreographers.